Die ADM (Atomic Demolition Munition) spielte eine wesentliche Rolle bei den Planungen und "Kriegsspielen" im Bereich Fulda GAP. ... the Fulda Gap. I was in the 58th Engineers, Fulda, from Dec 1963 till Aug 1965. We were the keepers of special weapons (Anmerkung: ADM). Find that this information - as best as I can tell - is still "Secret", so will only give vague information ... Anyway, we (58th Engineers) were stationed in Fulda at Downs Barracks and in our basement were three (3) Nuclear Weapons. All of different sizes and for different purposes. The smallest being to take out Downs Barracks, middle one I am not sure about, but the largest being just a bit larger than a 55 gal. 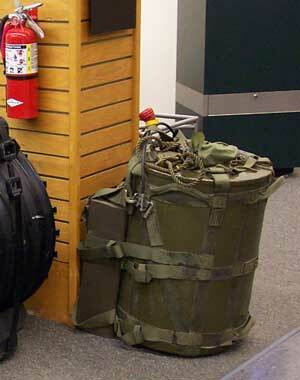 drum to be taken to the Fulda Gap to stop the Soviets. Being in First Platoon and the Platoon Leaders driver, it was our job to take the largest one up to a specified point on the border where we were to set the timer and protect it till it went off. "DAMN!" Were told it was approximately 100 times stronger than either of the two used in Japan but I could be wrong because that was a LONG time ago. But it would have created one helluva pond anyway, I'm sure. Oh, the reason I don't know where the middle one was to go is because we were not allowed to know but had heard about the small one by accident. Anyway, you asked about the special weapons. They were in our basement and it was the Engineers job to Arm/Ignite them - as Always! This is just one of the many things we did. The 14th Cav. may have been charged with escorting us up to the border, this I do not know. But I do know MY job was to drive us three and the larger weapon up there where the Officer armed it then we were to guard it till it went off. As for what the 14th Cav. or the 3rd Armor was to do I do not know. I know the 58th Engineers / Fulda's main job was this and once the problem went away the 58th was disbanded, as I might add it had before. The 58th was part of V Corps. Auf einigen Webseiten ist heute noch zu lesen, es sei "unklar" ob der Einsatz von ADM in Deutschland vorgesehen war; dies ist veraltet. Heute steht unter anderem anhand der NATO Planungen (General Defensive Plan V. AK/USA), aber auch durch Aussagen von ehemaligen amerikanischen Armeeangehörigen (siehe oben) fest, das für bestimmte Objekte und Gebiete auch nukleare Zündung geplant war. Die "Sprengschächte" allerdings waren dafür NICHT vorgesehen.